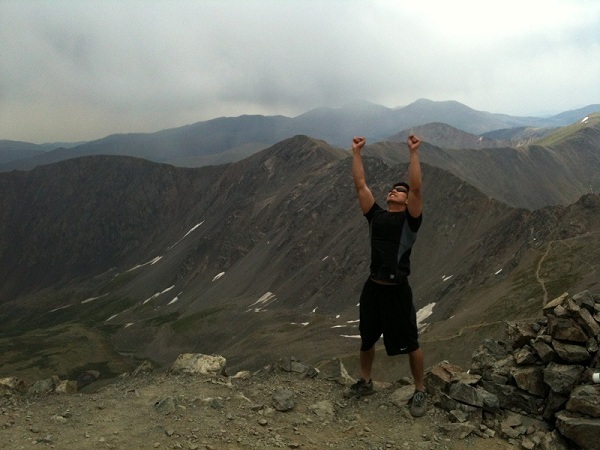 Last weekend, I hiked my first 14er. 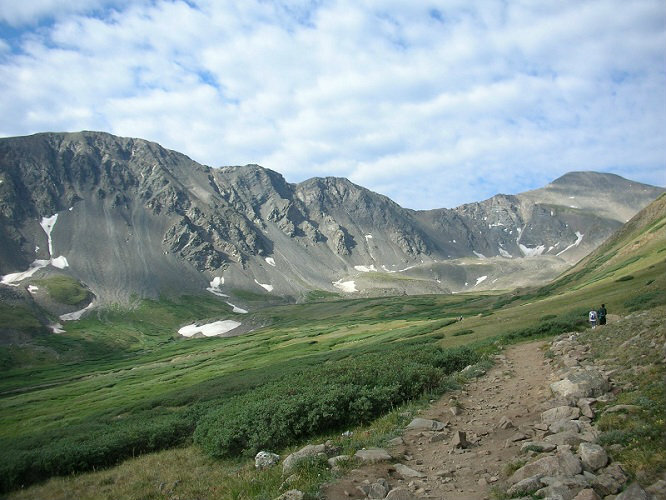 The term ‘14er’ refers to any mountain peak that rises above 14,000 feet above sea level. While I’ve hiked trails in Colorado before (sub-12.5k feet), I didn’t realize how different and challenging a 14er can be! The group consisted of myself and two friends from California visiting for the weekend. Since we had no experience with 14er’s, we settled on a Class I route involving Gray’s Peak first, with a second climb to Torrey’s Peak after. According to ProTrails, the hike was 8.4 miles round-trip with a net elevation gain of 3,011 feet. 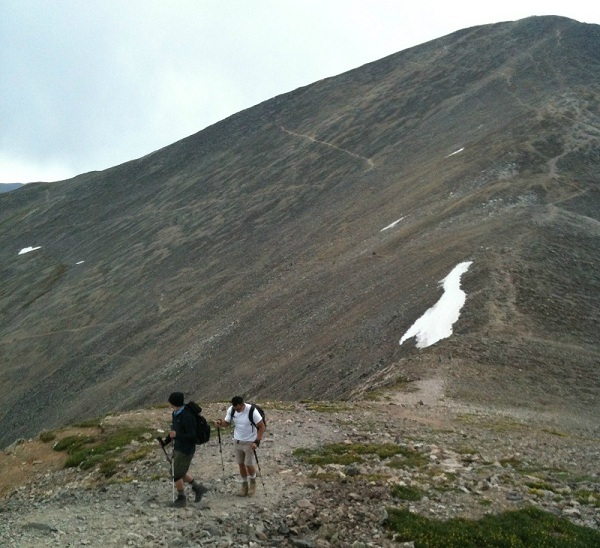 The trailhead started at 11,259’ and the peaks topped out at 14,270’ and 14,267’. We began the trek at 8:12 am. The weather was cool, maybe low 60’s at the car. The first section through the valley was relatively even and it was easy to keep a steady pace. Since high altitude compounds the body’s need for water, we all reminded each other to stay hydrated. Having CamelBaks were handy in that we didn’t have to stop to pull out water along the way. 3/4th of a mile in, the trail began to incline more. After the first steep climb, we were all feeling the burning sensation in our legs, the shortness of breath, and the sweat forming on our backs. The weather had warmed up considerably and we were down to t-shirts and shorts at this point. As we ventured further along, the switchbacks became more frequent and the trail grew steeper. The well groomed gravel we walked on earlier had transformed into uneven rocks and boulders. On my hikes in the past, I’ve always been surrounded by trees, mountains, and bugs. It’s a cool sight when you look up and just see a rock quarry around you. We made it to the top of Gray’s Peak around 11:20 am. For some reason, I expected it to be more.. majestic. Where were the rays of light from heaven, the singing angels, and the friendly animals that ate from our palms? Instead, all we were greeted with were booming sounds of thunder from the rain clouds heading towards us. Nonetheless, the view was breathtaking and I couldn’t have been more proud of us making it up there. I read somewhere that air temperature drops an average of 5 degrees for every 1000 feet gained. It felt pretty true. Combined with strong winds and cloud cover, and it definitely turned chilly quickly on the summit. After a quick snack and some pictures, we pushed on to Torrey’s around 12:00 pm. 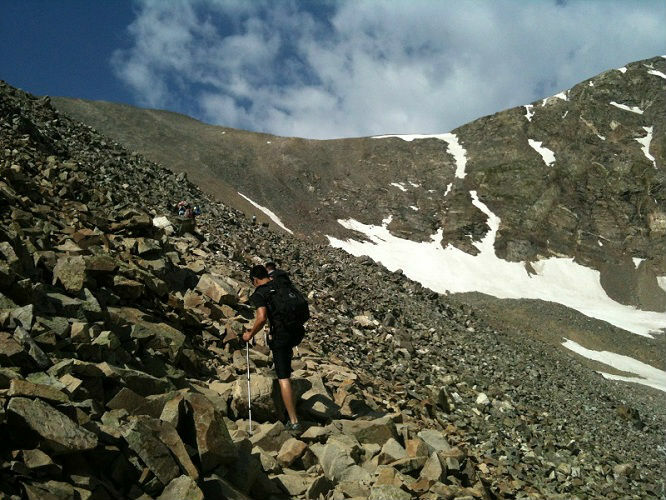 The easiest way across was to descend Gray’s Peak and take the mountain pass to Torrey’s. 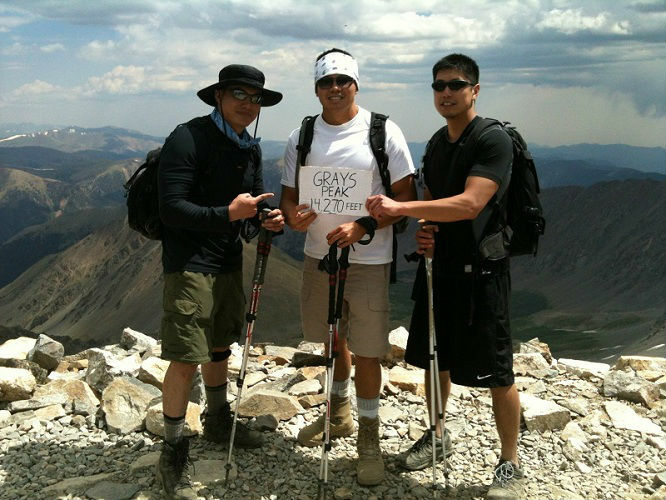 In the picture below, you can see Gray’s Peak in the background as we started the ascent to Torrey’s Peak. A couple hundred feet up up Torrey’s, the weather took a drastic turn. It was the beginning of July, Colorado had just gone through a heat wave, and the last thing any of us expected to see was.. snow. Yes, the soft fluffy stuff snowmen are made of. To make matters worse, the ominous thunder clouds were moving in fast. There was a chance we were going to be stuck in a thunderstorm near the top of 14er. Not good. We didn’t spend too much time at Torrey’s with the skies flashing and thundering near the other mountain peaks. A member of the team also came down with altitude sickness so it was good time to leave. On our descent, it began raining lightly. A couple minutes later, we were pelted by hail. Is this for real? Luckily, we were semi-prepared with extra pants, gloves, rain jackets, and ponchos. The hail eventually subsided into a steady rain shower, which made navigating the rocky terrain slippery and challenging. Our trekking poles helped tremendously. Finally, while navigating the switchbacks down, super winds hit us, making our trek along the narrow paths even more dangerous. We made good time on our way down and clocked in at the car around 3:50 pm. Later that night, we went for pizza with friends where our tales of courage and valor were told over and over. We were all smiles at that point and already planning the next 14er. I don’t think pizza ever tasted so good.